Without Water, Will There Be Wine in California? When you grow grapes to make wine in California, the mention of "D4" can wither you on the spot. 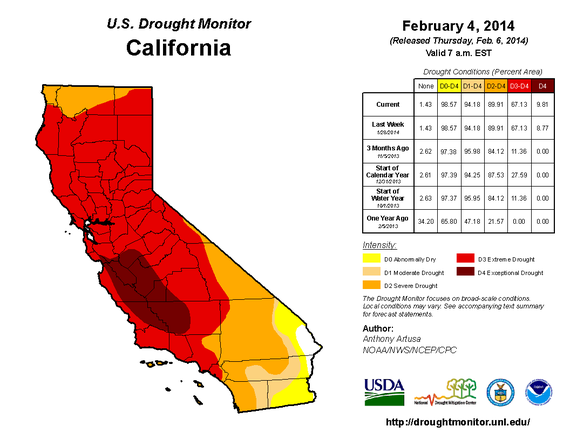 "D4" is the classification used by the interagency U.S. Drought Monitor reserved for dry spells so intense they occur fewer than once in 50 years, with more than 98 percent of California land now considered at least abnormally dry. Such reports are terrifying to every farmer in the state, but in the wine industry, where irrigation is critical to raising healthy, bountiful grapes to be made into prestigious wines carrying $100 price tags on their labels, such a drought has no precedent. California's reservoirs now contain only 39 percent of their combined capacity, which last month forced officials to cut to zero the amount of water local authorities would be allowed to draw from the series of reservoirs that supply 750,000 acres of the state's farmland. The drought has begun to cause vines to ripen early (September to October is when harvesting occurs). Vintners are cutting back vines and planning fewer plantings, and the equation between the amount of water and the crop yield is dreadful: If you have 80 percent less water, you will produce only 80 percent of the normal crop. "Potentially without rain it could be severe for those who rely on water from reservoirs that only have surface water to fill them," he said. "If they fill their reservoirs with well water they should be able to get along, [but] those with shallow wells potentially will be impacted as they go dry or if their Water Rights are curtailed by the State of California. For those left without sufficient water this year yields could be significantly impacted without sufficient rain in the coming months." Fortunately many growers rely on wells rather than reservoirs in Sonoma, fed by the Russian River (now at 36 percent capacity) and Dry Creek (now at 65 percent). Having planned in advance for drought years, McIlroy feels Rodney Strong's vineyards are in fair shape, but many growers who supply some of their grapes will be impacted without significant rain. "If it doesn't rain we certainly see some loss of production for 2014 and potentially for 2015." I asked McIlroy about a proposal to truck water into the vineyards, and he replied, "It would work only for very small vineyards, and even then it will be expensive." Many vintners I've spoken with in California, South America and Europe, have serious concerns about the demonstrable effects of global warming. "It was the long-lasting heat wave of 2003 all over Europe that made us realize something was going on," says Axel Heinz, director of production for Tenuta dell'Ornellaia winery in Tuscany. "The weather is now getting more and more extreme and unpredictable with sudden heat spikes, long lasting drought periods and violent and unpredictable rainfalls." 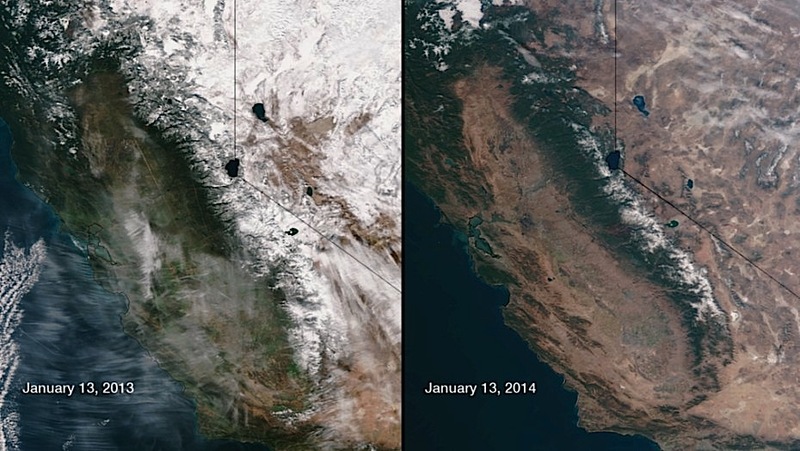 The photo from NASA shows the contrast of snow and greenery in California from January 2013 to January 2014. Such spikes make it difficult for winemakers to adapt quickly. When grapes get too much heat and not enough water, they develop off flavors and lower acid levels, higher alcohol levels at earlier stages, and become more susceptible to sunburn and disease. Wine grapes actually shut down their own development when the temperature becomes intensely hot. Unlike so-called "broad acre" crops like soybeans and wheat, "wine grapes are really a 'niche crop' that can only been grown in certain areas," says Dr. Gregory V. Jones, professor and research climatologist in the Department of Environmental Studies at Southern Oregon University. "The issue today is, when we talk of global warming, we talk about humans' contribution, which is occurring at a much faster rate than in recorded history. What we used to consider a one in 50-year drought is now more commonplace. The extreme heat of 2012 in U.S. was one in 1,600 year event." 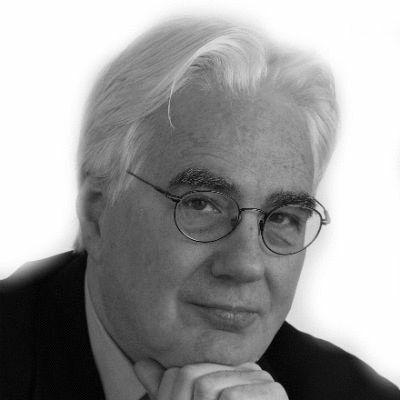 McIlroy agrees: "Most climatologists reporting on the current drought say that it is something that historically happens in California, even though [this one] could be the worst in living memory for California." 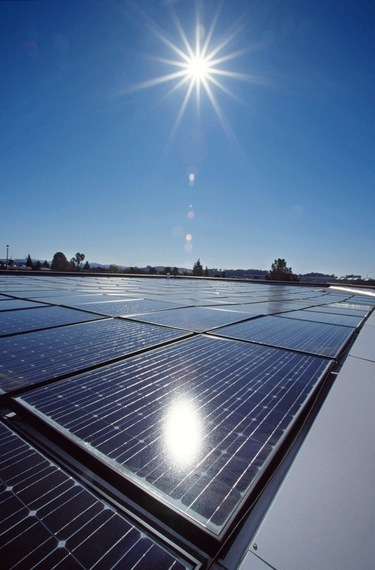 Fortunately, Rodney Strong's vineyards, whose founder, in 1959, retired from a career as a professional dancer to become a vintner, has long been committed to being certified in the California Sustainable Winegrower's Alliance, and, through solar power (below) and other practices, has actually lowered its carbon impact to zero. Every sensible vintner is hurriedly devoting time, money and research into combating the climatic uncertainties of the near future. "Drought-tolerant rootstocks are already used in low water areas," says McIlroy, "But they only help so much. There is work at University of California Davis being done improve the options." 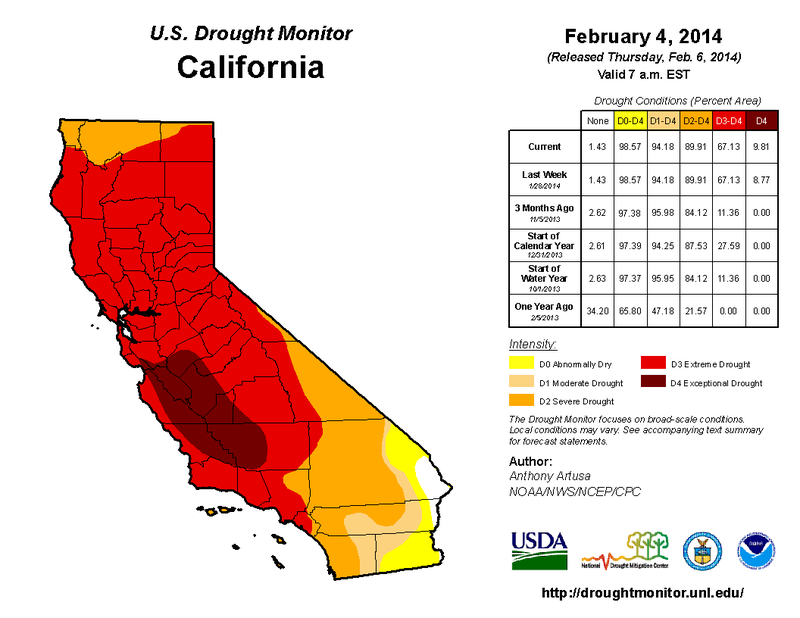 Yet even if the drought ends this year, he warns, "the State most likely won't see much relief without an above average year next year or a normal pattern returning for more than a year."